Hiroshima University provides chartered bus services between JR Hiroshima station and HU Higashi-Hiroshima campus on August 4th and 5th, in which exams will be held. Click here for the details. Click here for the details about bus services between Higashi-Hiroshima station and HU Higahi-Hiroshima campus on August 4th and 5th. We would like to inform you that the makeup classes for the canceled classes and the final exam will be held at each campus in accordance with the schedule posted on My MOMIJI and our official website on 13 July (Fri). Although the bus service between Higashi-Hiroshima station and Higashi-Hiroshima campus is unavailable on Saturdays and Sundays, we are currently asking the bus company to operate the service on 28 July (Sat), 4 August (Sat) and 5 August (Sun) as well. Please regularly check the URL below to confirm the most updated information about traffic accessibility to the campus. In addition, we would like to ask you to arrive at the campus well in advance with your safety in mind when you commute there on the above day(s). *As information regarding the makeup classes will be provided via My MOMIJI ("Cancellation/Make-up Classes/Classroom Changes" section), please check it continually. *Besides, regarding the exam schedule, please check My MOMIJI ("Exam Information" section) too or follow teacher's direction. After carefully considering all the circumstances, we would like to inform you that we will resume all the classes from 17 Jul (Tue) (date inclusive). Currently, traffic accessibility to Higashi-Hiroshima campus is getting better because of improvement in traffic conditions around Higashi-Hiroshima city and the road reopen of Sanyo Expressway. In addition, we will offer our own chartered bus service and accommodation for students who have difficulties commuting. However, we would like to ask all of you to make your own safety the first priority. So, when there seems to be difficulties commuting safely, please contact Student Support Office at your faculty by E-Mail and refrain from commuting. 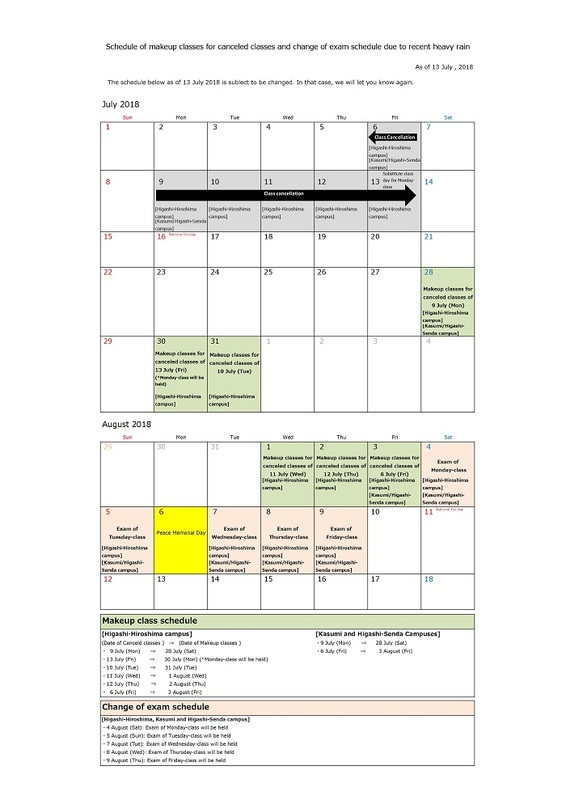 About the schedule of resuming the classes, make up class information, change of term-end examination period etc. On July 6 (Fri) and July 9 (Mon), classes were cancelled at all campuses. As for Higashi-Hiroshima Campus, classes were cancelled until July 13 (Fri) since no significant recovery of road conditions was expected. As of this date, classes are scheduled to reopen on July 17 (Tue), however, the final decision will be made on July 15 (Sun). For the most up-to date information about make up classes and term-end exam period etc. please visit this wepage “Cancellation and Commencement of Lectures”, or check the emergency information on “MOMIJI”. The make up classes for the canceled classes on 9 July (Mon) at Higashi-Hiroshima, Kasumi and Higashi-Senda campuses will be held on 28 July (Sat). All the lectures at Higashi-Hiroshima campus will be canceled on Friday 13th July as well. We are considering the class resuming of Tuesday 17 July, however, we will let you know again after carefully making a decision on Sunday 15 July whether we will resume or continually cancel them. All the lectures have been cancelled until Thursday 12th July and are expected to commence from Friday 13th July in which case the lecture schedule on that day is going to be that of Monday, and NOT of Friday. All the lectures will be commenced from Tuesday 10th July.